One of the most popular pieces I've written this year was Tuesday's discussion about Abacus, Google, and Brand Implosion. Almost nobody chose to leave a comment. But you're reading this article, you're forwarding this article to friends and co-worker. When you come to the site to read it, you're interacting with the site much more than usual. Interest in the article made yesterday the busiest day on the blog in the past eight weeks. Why is this article interesting to you, and why is the topic so divisive among the catalog marketing community? Why is this topic of interest to me? To me, it all boils down to "customer biodiversity". Online marketers excel at using customer biodiversity to their advantage. They drive traffic through a massive network of affiliates, often numbering in the thousands or more. Online marketers utilize portal advertising to reach larger audiences. Brilliant online marketers cultivate traffic through natural search, at close to no incremental cost. Most online marketers use paid search across hundreds, thousands or more keywords. All of this guarantees a diverse audience of potential and existing customers. Some strategies work, some fail. The marketer manages a complex ecosystem of marketing strategies and customers. Retail marketing is all about a complex interaction between "who you hang out with" and "target customer demographics". Nothing happens when you put a physical presence in front of the wrong target demographic. The right demographics and the wrong shopping center or wrong set of competitors cause problems. Combine the right demographics, competitive biodiversity, and a modern shopping environment, and cash registers sing. Catalog marketing, however, is being threatened by a lack of customer biodiversity. 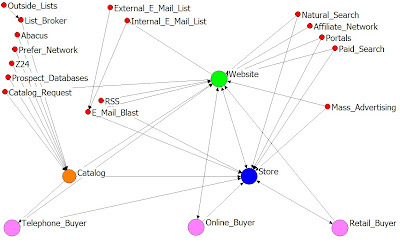 The entire left side of the diagram represents potential customer biodiversity for catalog marketers. In the past, the list broker was the gatekeeper of biodiversity. S/he managed hundreds of outside lists, s/he even fueled the growth of compiled lists because s/he wanted to do "what is right for the client". In the process of doing that, s/he ceded market share to the compiled lists. This hastened the decline of the list broker, and accelerated the rise of the compiled list vendor. In 1990, one list broker ensured customer biodiversity by simultaneously managing a hundred relationships with competitors. Today, the same service can be provided by one statistician creating a statistical model at a compiled list vendor. There was a lot of discussion about postal rate increases at last week's catalog conference. Obviously, this is an important topic in the short term. Long term, there must be a significantly increased focus on customer biodiversity. The success of a multichannel business is predicated on the ability of the retailer to align with the target customer across a wide variety of potential sources. My experiences tell me I want to spread my marketing efforts across a thousand affiliates, several large portals, natural search, paid search focusing on several hundred or more keywords, e-mail marketing, RSS and applicable Web 2.0 marketing, several compiled lists, several dozen or more rented/exchanged catalog lists, catalog requests, and other prospect lists. This gives me a portfolio of opportunities to manage. I do not want one statistician who knows nothing about my brand culling prospects out of a compiled list as my primary source of new customers. I'd love for this statistician to be a piece of the puzzle, not be the entire puzzle. All right folks, here's your chance to shine! In total, your customers spent $1.8 million dollars. As you can see, the fourth and fifth customer segments did not receive a catalog, and consequently, did not generate any telephone/catalog demand. Last year totals are calculated by multiplying households by the sum of catalog and online demand. For instance, in customer segment 1, total demand = 50,000 * ($5.75 + $4.25) = $500,000. This year, you have a new forecast of households in each segment. In addition, your management team is allowing you to mail each of the five segments of customers. The quiz: Tell our loyal readers how much demand, in total, you expect to occur by mailing all five customer segments. Explain your logic in the comments section of this post. Good luck!! Using Abacus for customer acquisition has always been a hotly debated topic in catalog marketing. Many circulation experts have always enjoyed their relationship with their favorite list broker. It's fun to exchange 50,000 names with Talbots, to net out 24% and realize, by default, that you share the exact same customer as your competitor. It can be a rush to test a Crutchfield 0-3 month $100+ select, and see the list work. List rental, exchange and brokerage requires gut feel, instinct, business savvy, and negotiation skills. Then along came Abacus. You dump your housefile into their database. You then have access to modeled prospect names for something like seven cents a name. You have no idea which names you're getting, you just know their model picked "good" names, names that have an "affinity" to your brand. At first, big companies hated this idea --- why should a big company dump six million names into the compiled list, only to realize that sixty percent of the compiled list is your customer? Once Abacus achieved scale, all contributors theoretically benefited. Another funny thing happened along the way. The performance of Abacus names rivaled that of rented/exchanged lists. Why go through the hassle of managing 73 different lists in a mailing, when Abacus can automate the process for you? The evolution of catalog customer acquisition is driving companies toward Abacus, away from the good folks at Millard and Mokrynski. Except for one person I recently spoke with. This person made an interesting observation. He told me that almost all of his customer acquisition is from Abacus. He told me that the performance of Abacus names continues to be good. But, his housefile names are not performing well anymore. I asked this individual what his twelve month buyer annual repurchase rate was. The answer ... thirty percent. Remember, this individual does almost all of his customer acquisition via Abacus. So, two years ago, this individual had 100 buyers. 30% repurchase. This person has to recruit 70 new customers ... almost all from Abacus. In year two, there are 30 existing buyers, and 70 from Abacus. 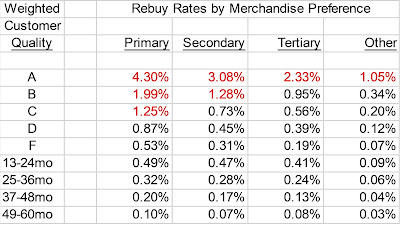 30% of each list repurchase. This leaves us with 9 existing buyers, 21 existing buyers from Abacus, and 70 new customers from Abacus. Within two years, 91 of 100 customers are from Abacus. Obviously, some names come from other lists, or from lapsed buyers. So let's assume that just 75 are from Abacus, not 91. Still, in just two years, 75% of the active housefile are Abacus-sourced buyers. And this individual points out that his housefile names aren't working well anymore. If your annual repurchase rate is in "Acquisition Mode", under forty percent, and you do the vast majority of your customer acquisition work with Abacus, you've got an interesting dilemma. In just two years, the vast majority of your active housefile is sourced from Abacus. Remember, this individual says his housefile names no longer work well. Hmmmmmmmm. This isn't the fault of Abacus. They are simply providing a service that clients are willing to pay for. No, this is the fault of circulation experts. It is our fault! We're doing this to ourselves. Not smart! Our business models participate in a big ecosystem. Unwittingly, we are moving our ecosystem away from something we control, toward something we no longer control. In this example, Abacus now owns the brand I spoke of, with housefile productivity imploding as we speak. The success or failure of the brand is no longer in control of the merchants who pick great product. Instead, the brand depends upon the type of names that Abacus makes available for the client. And all you online marketers, if you think you're immune to this, you're not. Where do you get all of your customers from? Google? Abacus is tiny. Google owns the world. Once we've saturated the online customer market, Google plays the role for online marketers that Abacus plays for catalog marketers today. Multichannel CEOs and CMOs: If your annual repurchase rate is under forty percent, be wary of sourcing the majority of your new customers from one vendor. The dynamics of your housefile dictate that, within just two years, that vendor determines the fate of your brand, not the product/creative/service/brand strategies you initiate. Last week, Dell agreed to sell computers in Wal-Mart stores, even though management repeatedly assured us that they are a direct-to-consumer brand. The punditocracy tells us we need to emulate Circuit City and their "Buy Online, Pickup In Store" multichannel program. Yet, Circuit City is fighting to stay in business, as sales sag. Weren't we told that multichannel customers were the best customers? If Circuit City provides a great multichannel experience, then why in the heck aren't they swimming in a pool of profit produced by a ton of multichannel customers, the most valuable of all customers? Of course, Circuit City competes with the successful Best Buy chain of electronics stores. The punditocracy tells us we should emulate Best Buy's "Customer Centric" approach to store design. On the surface, that would seem like a good idea, because they're killing Circuit City. And yet, Best Buy is accused of allegedly implementing a "bait and switch" program, whereby customers saw one price online, then were shown a higher price in an in-store online version of the website. If this is true, how "Customer Centric" is that? And if the lawsuit is proven to not be valid, the small number of customers who received a higher price did not receive a "Customer Centric" experience, did they? Dell, Circuit City and Best Buy are "brands" that have a veritable plethora of hard working, earnest employees, all trying to do what is best for their customers and shareholders. Each week, the punditocracy tells us who we should emulate, and why. All too often, their logic is flawed. We shouldn't copy Dell and their direct-to-consumer model. We shouldn't copy Circuit City and their "Buy Online, Pickup In Stores" program. We shouldn't copy Best Buy and their "Customer Centric" approach. Instead, believe in yourself, and do what is best for your "brand". Give me someone to believe in --- YOU!!! How Much Do I Spend On Online/Catalog Advertising? Lands' End was a fun place to work in the early 1990s. There were a lot of interesting minds, tossing around interesting ideas. One of our debates was about the optimal level of advertising spend. One camp, led by our Circulation Director, believed that you circulate to an incremental 7% pre-tax level (prior to subtracting fixed costs). The theory was that the return on investment had to be sufficient to cover fixed costs ... that if you actually subtracted fixed costs from the equation, you were circulating to about break-even. Another camp believed that you circulated to -5% pre-tax levels, because this way, you were capturing long-term profit that you were losing in the short term. At the end of five or ten years, your business was much bigger, because you acquired/reactivated a lot more customers than in the situation where you maximized short-term profit. At Eddie Bauer, we circulated to break-even (prior to subtracting fixed costs), then shifted our strategy to invest to below break-even, in order to maximize the long term health of the business. At Nordstrom, we tried our hardest to convince folks to invest in online marketing activities that maximized the long term health of the total business. We probably under-invested in the online channel, though we had the data to tell us what the 'right' thing was to do. The process of assigning a marketing budget did not provide us the flexibility to maximize the online channel (and ultimately, to grow store sales). This is a good lesson --- it doesn't matter what data you have, there are internal processes and existing cultures that simply cannot be changed. In the past, we didn't have the right tools to understand the long-term impact of short-term advertising decisions. With Multichannel Forensics readily available these days, we can simulate different strategies, and identify the best long-term strategy. I crafted an online/catalog business simulation, and ran three scenarios. Scenario #1 = Maximize profit each year. Scenario #2 = Maximize total profit over the course of five years. Scenario #3 = Maximize profit five years from now --- make that year as profitable as possible. In the first run, profit is maximized by year. Therefore, profit in the first year is $2.1 million. However, a much smaller business exists going into year two, with too few customers to generate large volumes of profit. Still, the management team tries to maximize profit in year two, then year three, year four, and year five. As a result, this business actually contracts. If we followed the rules of Wall St. (maximize short term profit), we may not protect the long term health of our business. In the second case, online/catalog advertising spend is more than twice as much as in the first simulation. This means the business is more profitable in the long-term, and grows at a much faster rate. In the third case, online/catalog advertising is fifty percent more than in the second case. This yields a marginally profitable business in year one, but in year five, the business is much larger, and more profitable. For every online/catalog business, these scenarios can be easily created. The multichannel analyst provides management with three or more scenarios (as outlined above), and lets management determine the future trajectory of the business. This is an important point --- abstract and geeky topics like lifetime value have little or no meaning to executives. Picking from one of three possible strategies is easy to do if you're an executive, and accomplishes the exact same thing as a geeky, technical lifetime value analysis. Multichannel CEOs and CMOs: Simulations indicate that it is important to invest in unprofitable customer activities in the short term, in order to protect the long term health of your business. It is important not to focus on "this year". Where possible, invest in the short term, to protect the long term health of your business. If there was ever a good time to spend six dollars on an article from Harvard Business Online, today is that day. The article, "Back In Fashion, How We're Reviving A British Icon", is written by Stuart Rose, the CEO of Marks & Spencer, a gigantic British retailer. He took over the reigns of the struggling retailer in 2004. He fired the consultants. He focused on what is important ... product, store experience, and customer service. He had to cut staff, and did so. He asked folks to stop hiding behind data, and to stop being paralyzed by what data suggested. He outlines marketing and advertising activities that aligned with his vision of the business. More than anything, he asks employees to focus on the basics, to believe their "gut" feelings about products, to take care of customers. This article is a great case study in doing small things that result in solid business performance. If you're looking for the next "big idea", don't read this article. If you're looking to build your business by focusing on the basics, Mr. Rose leads you through a case study that outlines how this happens. Here are the top ten blogs in the Friends of MineThatData for May 2007. Please take a look at the content these authors are writing. 8 = Luna Metrics, 2.5 (was 4.8 prior to new URL). Would You Buy This Multichannel Solution? What has happened to the writing style used by folks in the multichannel marketing world? At the end of my time at Nordstrom, I nagged my staff all the time about saying things that "Oprah and her television audience could understand". The data were seldom as important as the message used by the communicator. Tell me what the following writing sample communicates to you. Pretend that "movie voice", the guy who does the previews in the movie theater, is saying this. Is this an effective form of communication? If it is effective, what is it about the copy that makes it effective? If it is not effective, how should it be written to become effective? In today's fiercely competitive retail landscape, the need to squeeze value out of every customer transaction has never been greater. There has never been a time in history when placing the right message to the right customer at the right time has been more important. And yet, customer loyalty has never been more fragile. A recent Forrester Research study indicates that eight-six percent of customers are frustrated with their overall shopping experience. We all know that it costs fourteen times more to acquire a new customer than to retain an existing customer. And yet, the "C-Level Suite" seems to be focused on other initiatives. Could anything be more important than customer loyalty? Maybe that explains why the average Chief Marketing Officer survives for only twenty-three months. These days, multichannel retailers won't survive if they cannot provide solutions that exceed the needs of savvy online shoppers who switch loyalty at the click of a mouse. What is the "C-Level Executive" to do? Here are three suggestions that any CEO can implement immediately to significantly grow top-line sales. First = Apply Modern Targeting Strategies. Are you tired of receiving an endless array of useless catalogs in the mail? I am. Today's busy consumer doesn't have time to thumb through 124 pages of products she doesn't want. E-mail provides a viable, cost-effective, relevant, targeted alternative to destroying our planet by harvesting trees for the purpose of commerce. Second = Become "Customer Centric". The days of managing brands by product lines or silos are over. Executives who manage the business on the basis of products or silos are destined to follow the path of the dodo bird ... extinction. This requires discipline, and a tops-down management initiative that communicates to employees that they need to focus on customers, not products, to survive in a chaotic marketing environment. By aligning incentives around key initiatives, the "C-Level Suite" properly focuses activities around the appropriate drivers of future business success. Third = Implement "Multichannel Solutions" That Drive Customer Loyalty . According to Forrester Research, multichannel customers are worth six times as much as single channel customers. And yet, retailers continue to ignore systems implementations that bond customers to the brand forever. Studies indicate that multichannel organizations generate earnings that are 1.6 times as great as single channel brands. There's never been a better time to implement a systems solution that increases ROI (Return on Investment) while delivering upon the brand promise. Today's complex marketing environment may provide endless challenges to today's time-pressed executives. Fortunately, multichannel solutions exist in the marketplace for managing these challenges. By implementing a multichannel solution that is supported by e-mail, the executive is able to retain and nurture loyal customers, ultimately driving a dramatic increase in ROMS (return on multichannel solution). There has never been a better time to implement a multichannel solution. Eldon Rothschild is President of Acme Multichannel Solutions, a leading provider of e-mail and multichannel solutions for Fortune 1500 brands. Eldon can be reached at eldon.rothschild@zzz.com. The Friday before Memorial Day weekend is one of those magical times at work. Many of your co-workers are enjoying vacation today. There are not a lot of meetings. Following this weekend are fourteen wonderful summer weeks, just a small sliver of the year. Take advantage of this day before the big weekend. Be creative. Create something. Tackle a problem outside your area of responsibility. Leave work a little early, and spend time with your family. Explore my blog. Honor our troops, especially those who gave their lives so that we can achieve our potential. The fact that Dell may be moving deeper into the retail space, while the Discovery Channel announces they are exiting the retail space must be flummoxing to the multichannel punditocracy. Weren't we told that "clicks and bricks" would trump online-only pureplays? And didn't Dell tell us they thoroughly believed in their direct-to-consumer strategy? Focus on what your customer wants you to do, not what the punditocracy wants you to do. An open-ended question for you. During my time at Nordstrom, I paid the Direct Marketing Association more than $200,000 in annual membership dues from my operating budget. That's money that I could have spent doing things that benefited Nordstrom, or more importantly, benefited my staff. Think about this ... we had to generate between $600,000 and $1,200,000 in sales to cover the profit lost by paying these dues. We had to sell an additional 6,000 to 12,000 pairs of shoes to cover the profit lost by this expense! If you belong to an association, what do you believe is a valid return on investment for your annual dues? Whether you belong to a stamp club that charges $10 annual dues, or you are an $8 billion dollar business paying a huge organization $200,000+ over five years, what is an acceptable ROI? How would you measure ROI? Thanks very much to those of you who joined me for my talk today at the Seattle DMA event, "Market To The Max". A great crowd, and great questions! Follow this link to download slides from the presentation. Multichannel CEOs and CMOs: How do you make decisions that shape the future of your business? Recently, the best and brightest analytical minds (David, Jim, Ron) lamented the fact that Lifetime Value is not a widely accepted business concept. The concept was re-branded as "Return On Customer", with (at best) marginal corporate acceptance. Loosely defined, lifetime value is the present value of future profits. Lifetime value frequently appears in two different ways. First, analytical folks focus on an analytical and financial approach to managing the business. Second, brand marketers focus on advocacy of customer rights as a way of increasing long-term shareholder value. If we could only get these two audiences to work together (analytics/finance and brand marketers), we might have something! In many cases, Lifetime Value is discussed from an "outside-in" perspective. In other words, somebody outside a company (vendor, consultant) is trying to persuade somebody within an organization to purchase services, without knowledge of the real needs of the person "inside" a business. This can give LTV a bad name. From an "inside-out" standpoint, many companies indirectly measure Lifetime Value. Catalogers are particularly good at measuring LTV, they manage list rental activities on the basis of LTV. In many cases, the Web Analytics folks don't have the software tools to do LTV measurement. Yet, they indirectly know this is important, because they like to measure the behavior of "new verses existing" visitors. Retailers often think of LTV in terms of "market share" or "most admired brand". Regardless whether this is flawed thinking or not, increased market share or being an admired brand deliver some of the benefits of a business with a customer base delivering outstanding LTV. At some level, all companies and executives think about LTV. They just think about it differently than analytical folks, different than how the customer evangelist folks think about the problem. Even better, let's get all the LTV evangelists together in a room, and let's see if they do things that are in the best interest of their own personal long-term health and financial benefit? We smoke, or drink alcohol, or overeat, all things that reduce our lifespan. We don't spend money in the best way. We purchase a Lexus or BMW or Mercedes that will depreciate from $60,000 to $0, when we could buy a Toyota Corolla. How does this decision help our own financial LTV? We pay via credit card, then pay interest. How does that help our financial LTV? We ignore health issues until they present dire consequences. How can we expect "brands" to adopt LTV concepts when we don't take care of the LTV of our own financial or health concerns? Like anything else in life, we know that LTV is good for us. All too often, we fail to follow through on what we know is good for us. Based on my experiences working with business leaders, most would like to implement some version of LTV (they don't even know it is called LTV --- they just want a healthy long-term outlook that also generates lots of short-term profit). However, most Executives don't want the database marketing analyst hounding them about their thoughts and decisions. LTV is risk-averse. LTV might suggest that Apple focus on their core competency of making computers & software, might suggest they not invest in an unproven MP3 player that requires a significant capital investment. LTV tells you to invest in things that "work". Want to add new products to a catalog mailed to prospects? You can't, because new products probably don't have as good a LTV as existing products. Want to invest in a new creative representation of your "brand". You can't. LTV tells you that the existing creative is what is liked most by customers. Want to add a new catalog to your contact strategy? You can't, because LTV is telling you that you are over-saturating the mailing of your customers, lowering overall profitability. Want to add a third e-mail to the weekly contact strategy? You can't, because LTV tells you that too many customers opt-out after receiving more than two e-mail campaigns a week. Is your business in trouble, do you need to liquidate merchandise to open up your "open to buy"? Don't add a clearance catalog, because you'll lower the LTV of your full-price customers by converting them to full price + sale customers. From time to time, LTV proponents struggle to see the business the way the Executive sees the business. Similarly, Executives make short-term decisions that mortgage or sub-optimize the long-term value of the business. Somewhere in-between these viewpoints represents the appropriate way to implement ROI-based decision-making within a business. That in-between place requires a culture that is willing to accept this thought process. Those cultures are hard to find. Drew McLellan of Drew's Marketing Minute had a good idea --- ask a bunch of bloggers to offer advice for recent college graduates as they enter the business world. The result is an e-book --- download the text-only version here, or the full document with pictures here. When folks say that "it couldn't have happened to a nicer guy", they should be talking about Mike Galgon, one of the founders of Avenue A, the banner advertising company that became aQuantive. The online advertising agency was purchased by Microsoft for $66.50 a share, a considerable premium over the current price of about $35 a share. At a time when folks created flimsy business models, hoping to cash out via the drama of an IPO, aQuantive did things the right way. The CEO is the same CEO from 2000. Mr. Galgon, one of the founders, is still actively involved in the business. aQuantive is one of a very small number of success stories from the internet bubble era. I'm very happy for those folks!! P.S. Had I stayed for seven and a half years, I, too, would have been worth millions!! If you really want to test your professional character, see what happens when your business starts missing plan ... by 45%. Back in 2001, I was part of a new management team recruited by the esteemed Michael Smith (of Lands' End, Classmates.com and Bag, Borrow Or Steal fame). Our job was to fix Nordstrom.com, a division of Nordstrom that was posting hideous double-digit negative EBIT, year-after-year. In our first four months, we experienced something that tests professionals who think they're brilliant. A business that was failing mightily began to miss expectations by more than twenty percent. In fact, one series of catalogs missed plan by forty-five percent. That means customers liked the catalog so little that they spent almost half of what they spent in a comparable catalog the year prior --- a year where double-digit negative EBIT occurred. When your catalog misses expectations by nearly five million dollars profit (remember, numbers have been doctored a bit, to protect the innocent), folks begin pointing fingers at each other ... quickly! Your new merchandising expert blames the old administration. The old administration blames the new team. Your President suggests you don't know a thing about circulating catalogs. This is called "thinking inside the box". And it is damaging. You end up trimming circulation by more than half, to get rid of unprofitable names. By doing so, you only increase profit by about a hundred thousand dollars. And, you've made the business much, much smaller. Actually, your customers are making your business much, much smaller, because they're voting with their pocketbook that they don't like you. But this is where you get yourself in trouble, if you continue to "follow the rules". In other words, if you continue to circulate to a certain cutoff level, you are "certain" to run yourself out of business. You cut marginal names, the very names that will pay the freight in a year or two. Missing plan by 45% requires you to re-think your business model. In our case, many more members of the management team "left to pursue other interests, we wish them the best in their future endeavors". A stable team of leaders "gelled". 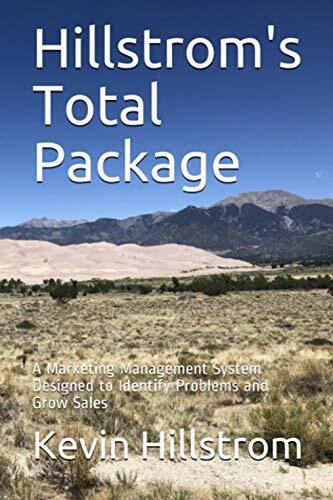 We "rightsized" the catalog business (fewer titles, fewer pages, fewer in-home dates, capitalize on e-mail and online marketing) A hideous profit and loss statement became one that any leader could be proud of. You don't learn a lot when your channel is constantly growing by twenty percent, or thirty percent. You learn a lot about business, and about people, when your channel fails to meet plan by forty-five percent. It will be very interesting to see what happens to today's online business leaders when the online channel begins to decline, an inevitability in the evolution of business channels. Personas are becoming a popular way to bring data to life, to make data actionable. In the late 1990s, we were looking for ways to reinvigorate the Eddie Bauer "brand". One way management chose to do this was to hire a team of brand marketing experts. There's no better way to generate new ideas than to hire a dozen brand marketing experts. This team created personas of the Eddie Bauer customer --- Ken and Karen, if I remember correctly. These folks were mid 40s but felt like they were in their mid 30s, $75,000+ annual household salary, sitting in the ski lodge next to a fire watching folks ski, after arriving in an Eddie Bauer Ford Explorer. Because these folks felt like they were younger than their mid 40s age, the brand marketing team felt our creative should skew younger, to reflect how these personas felt about themselves. Within a few months, a new creative approach appeared in our catalogs. The 46 year old graying male wearing jeans while walking along a raging river in Alberta was replaced with a 31 year old, muscle-bound set of men carrying a canoe over their heads. Instantly, mens pages in catalogs that were missing expectations by 10% became mens pages in catalogs that were missing expectations by 20%. In other words, the new way of presenting men in the catalog, based on the personas created by our brand marketing team, caused a ten percent reduction in demand of mens merchandise. There's nothing that strikes terror in the hearts of an Executive team than a ten percent decrease in sales volume, a decrease that is quite possibly self-inflicted. The brand marketing folks fought back, suggesting that it would take Eddie Bauer customers six months, a year, or two years to get used to the new creative. They were probably correct in their assessment of the situation. Meanwhile, inventory managers were frustrated, because they had to liquidate merchandise that used to sell better. Merchants were frustrated, because merchandise they believed in was not selling as well due to the implementation of a vision endorsed by the brand marketing experts. I recall sitting in a conference room on a Friday afternoon, watching this brand marketing team get chewed out like you wouldn't believe. Folks left the room crying. Within a year, most of the brand marketing team either lost their jobs, or chose to leave the company. The brand marketing experiment of 1998-1999 was over. Pressure causes leaders to make decisions that may not be in the best interest of the long-term health of the business. It is entirely possible that the brand marketing folks were doing the exact right thing for the "brand". It is also possible they unintentionally damaged the "brand". We still have to meet short-term sales expectations, regardless of the long-term vision of brand marketing experts. This conflict causes pressure. Personas may be the right thing for your business. It is how personas are implemented within your culture, how that implementation impacts short-term sales, and how short-term expectations are communicated to all employees, that determines how successful the business strategy will be. The good folks at Intelligent Results recorded today's webinar on Multichannel Forensics. The event was well attended. Thanks to everybody who joined me, I appreciate that you spent time listening to this topic. Please click here to listen to today's presentation. You'll be able to follow along with the slides as you listen to the audio portion of the presentation. Up next is the Seattle DMA's "Market To The Max" event on Monday, May 21. If you're in Seattle, stop by after the presentation for a chat! You'll also have a chance to hear uber-bloggers Robert Scoble and Ben McConnell, as well as Friend of MineThatData Chris Baggott at this conference. Tell Me About Your Vision For "CRM"
I recall reporting to an Executive who called CRM a "four letter word". This person felt burned by the failed promises of a movement that may have been ahead of its time (or maybe way behind the times) in the late 1990s. Maybe things would have been different if CRM were shepherded by marketing folks. Often, CRM was driven by the Information Technology folks, in partnership with vendors selling solutions. All too often, the focus was on "Management", not on the "Customer Relationship". These days, it gets harder and harder to define "CRM". I believe that's a good thing. Here are examples of "CRM" in the year 2007. The President of Whole Foods talks directly to his customers via a blog, allowing customers to respond to him. Nielsen and Experian enter an alliance to provide "CRM for CPG Companies", promoting use of a series of traditional direct-marketing techniques to traditional brand-marketing organizations. Tamara Gielen writes a great blog about using E-Mail to build relationships with customers. The American Catalog Mailers Association is formed to protect the craft known as cataloging. Google might say they own relationships with customers, by matching customer needs with vendors willing to pay Google the most to meet the needs of a customer. Salesforce.com might argue that they provide software that allows folks to manage relationships with clients. Do you believe that a "brand" can manage customer relationships? In other words, is the term "CRM" antiquated, given today's marketing environment? If you were building a "brand" from scratch, which elements of "CRM" would you use to build your business? E-Mail? Catalogs? RSS? Blogs? Paid Search? What else? If you're one of the lucky folks managing online or catalog marketing at a company that is "winning", you have an interesting opportunity. Let's say that this profit and loss statement represented what you expected to happen in April. You expected to generate $7,300 profit, and 1,176 new customers. Courtesy of the magic of your merchandising team, customers loved what you offered them, spending 15% more than expected. Here's the challenge. If you believe that during the month of May you will see similar results, you can pocket a similar level of sales and profit. This is one of those unique mysteries that complicate the lives of those of us who manage profit and loss statements for online or catalog channels. Choice number one allows us to pocket an additional five thousand dollars of profit. Choice number two allows us to achieve our budgeted profit, but grows the top-line by an additional $28,000, and adds an additional 337 customers that contribute to future sales and profit. I've always advocated spending more money when times are good, and spending more money when times are bad (to liquidate merchandise, but not at liquidation prices) --- holding to the marketing budget when business is close to plan. What would you do? Would you pocket the profit today, or, would you spend more to acquire more customers, customers that deliver future sales and profit? Your thoughts?